Rep. Patrice Arent is the only Jewish member for the Utah Legislature. The sole Jewish member of the Utah Legislature is speaking out against a flyer sent by her Republican opponent that appears to make veiled references to her religion. An image of the flyer circulated on Twitter over the weekend. The flyer was sent to voters by GOP candidate Todd Zenger. 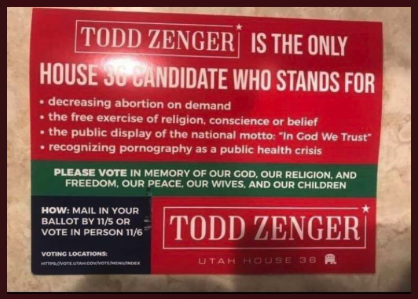 On them, Zenger, a Mormon, encourages residents to vote “in memory of our God, our religion and our freedom, our peace, our wives, and our children.” The quote is a reference to a Book of Mormon scripture. Several voters in the district shared photos of the flyer on Twitter over the weekend. Zenger is challenging Arent for the House District 36 seat, which she’s represented since 2011. Zenger denied the flyer was anti-semitic and in a statement said he was inviting people of all religious backgrounds to vote. The United Jewish Federation of Utah has also expressed concerns about the flyer. In a Twitter post late Monday, Gov. Gary Herbert weighed in on the controversy, defending Arent. "Having worked with @RepPatriceArent over the years, I can say that while we don’t agree on every topic, I have always appreciated her dedication to preserving freedom of religion and conscience," he Tweeted. The governor, a Republican and Mormon, then added that anyone "micharacterizing her position on religious freedom" should reference a scripture in either the Hebrew Book of Exodus or the Book of Mormon's Second Nephi. This post has been updated to add a statement from Gov. Gary Herbert.